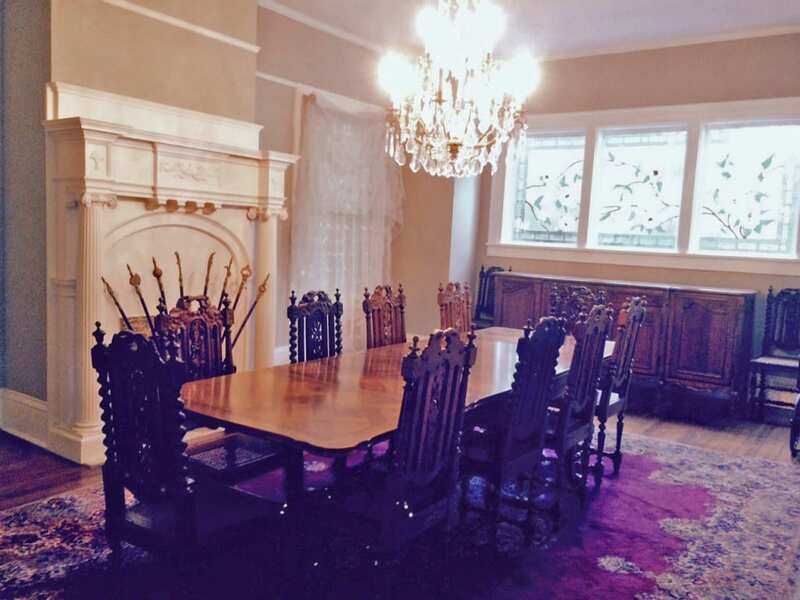 One of our most popular customer spotlights gave a tour inside Tamra’s Classic Newberry Mansion, complete with antique furniture purchased from us at EuroLuxHome.com. So, we were delighted to come across a feature about Tamra’s home in Columbia Living Magazine: The Summer House. The article talked about some of the furniture Tamra purchased from us and we found out some new facts about Tamra’s house. Here is the update! 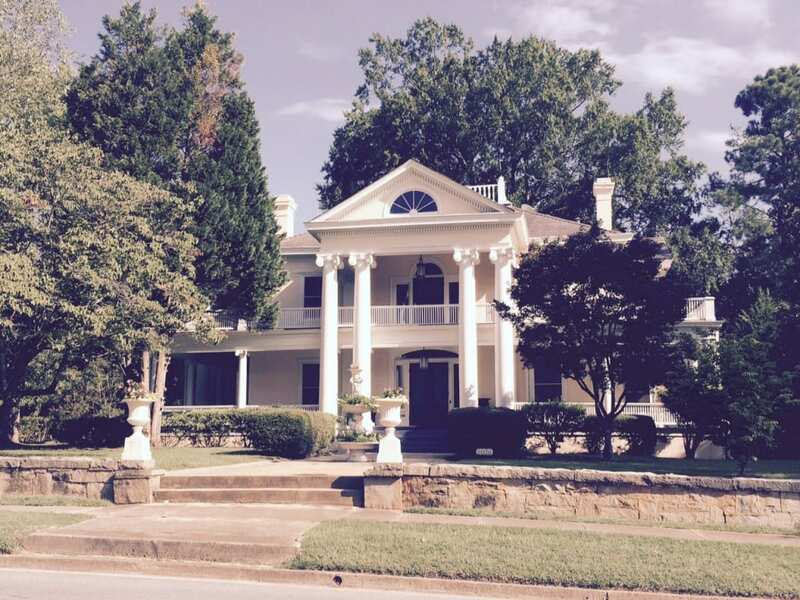 This is Tamra’s beautiful Greco-Roman mansion in Downtown Newberry, SC. It is so splendid it is hard to believe that at one time the house was at risk of being torn down because it was in such poor repair. Tamra and previous owners have put a lot of work into restoring it to its original glory when it was built in the 1890s! According to the Columbia Living Magazine article, the house was originally owned by John Harrison “Hack” Summer, hence the name “The Summer House.” It was built by Newberry contractor C. C. Davis, more often known as Cam Davis. A native of North Carolina, Cam Davis came to Newberry in 1884 to build the Newberry Cotton Mill. He went on to build many well-known residences, public buildings and churches in Newberry between 1884 and 1916. We discovered from the magazine article that The Summer House was designed by a 16-year-old. It’s amazing to think that such a young man could design this amazing neoclassical mansion! Craftsmen worked on the house in Newberry during the winter because in the summer they were working on the famous Biltmore House in Asheville, North Carolina. The magazine article drew attention to the pair of antique Mechelen buffets flanking the entryway. These are two of the pieces Tamra bought from us. 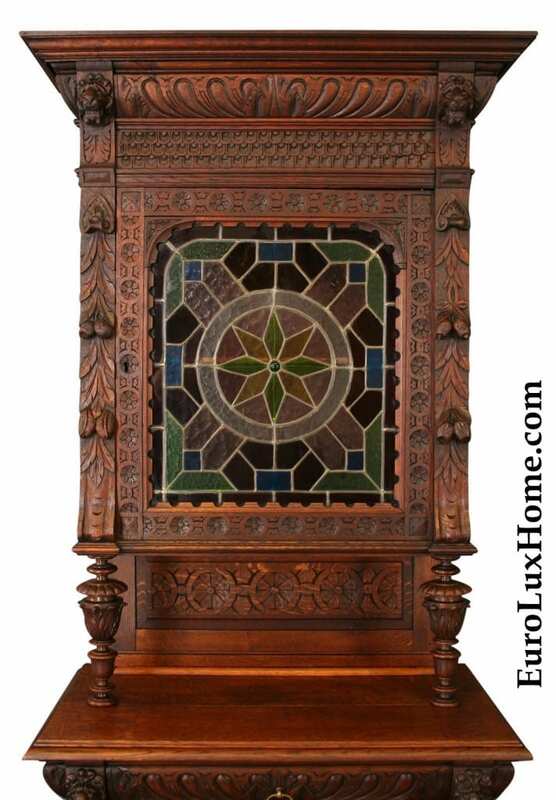 The article praised the heavily-carved cabinets’ “beautiful woodwork and stained glass insets.” The carving and stained glass are typical of Mechelen furniture, as you can see in my blog post What is Mechelen Style Antique Furniture? 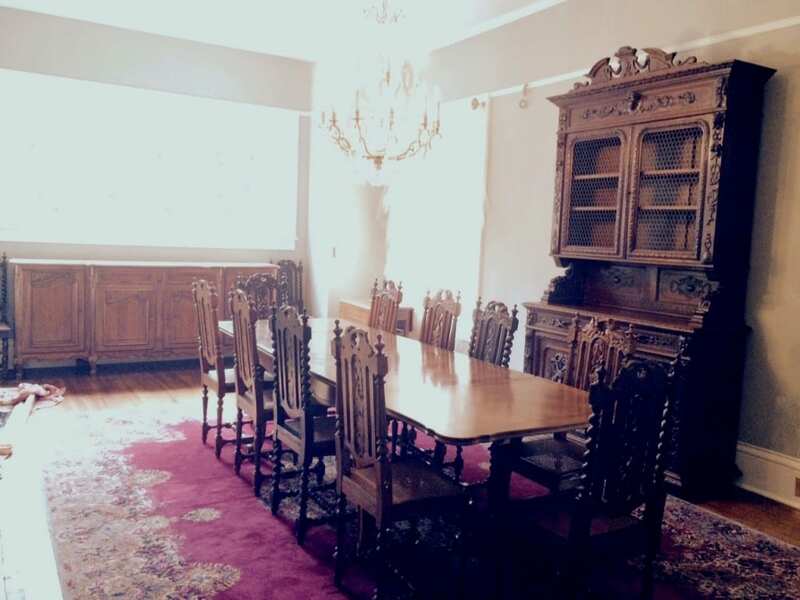 The formal dining room also received attention in the article, which made us happy as Tamra bought the French Country Louis XV extending refectory table in walnut from us, as well as two sets of antique French Hunting chairs dating to the 1880s. 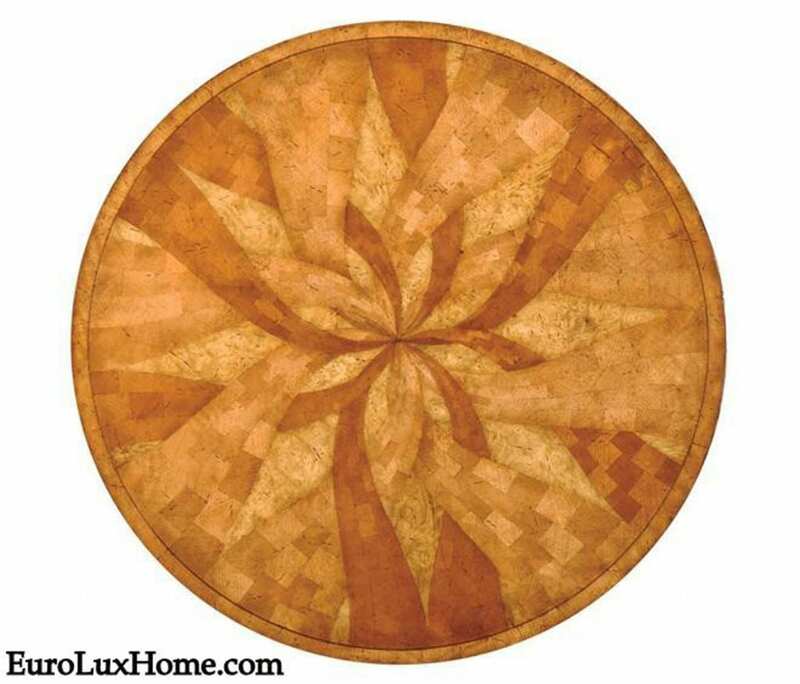 The article reads: One of their favorite rooms in the home is the formal dining room. 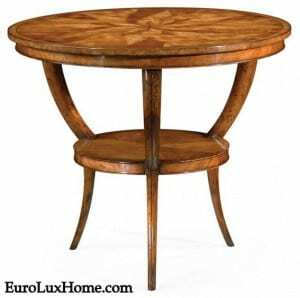 “We’re not finished in this space, but we’ve got the parquet French walnut table with the French thrones as a centerpiece. There is really beautiful woodwork on the queens,” Tamra said. 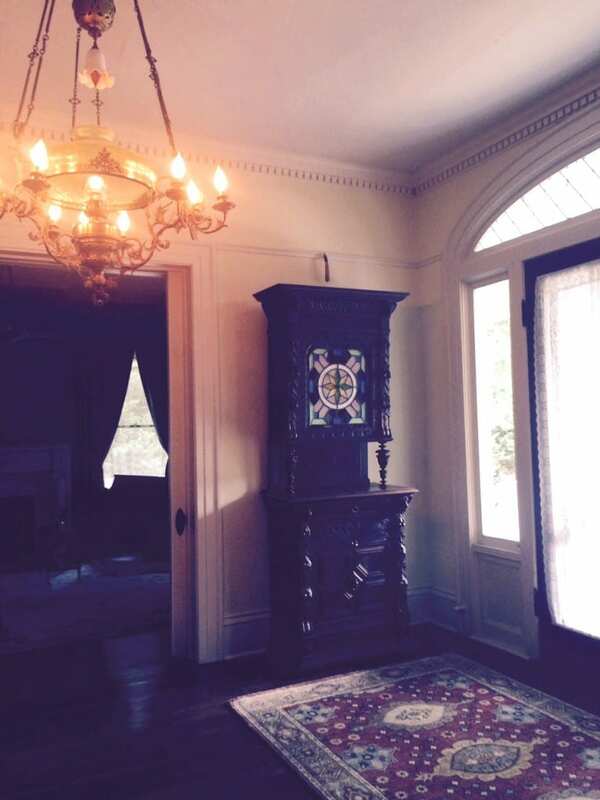 It’s wonderful to find out more about this beautiful house that Tamra has decorated so elegantly. You can read the full Columbia Living Magazine article here and also see more photos of the room interiors and antique furniture in my original blog post: Antique French Furniture in Classic Newberry Mansion. Aimee owns EuroLuxHome.com with her husband and best friend, Greg. Aimee sources amazing antique furniture, vintage lighting, & high-quality reproduction furniture to help her customers decorate their homes in a unique way. She loves her 8 (you read that right) fuzzy children and is renovating a 1920s bungalow in South Carolina. Find us on Facebook or connect with EuroLux on Google+. Or you can sign up here to receive this blog in your inbox. This entry was posted in Client Spotlight and tagged antique dining table, Antique French Country table, antique French Hunting Chair, Cam Davis, dining room, Downtown Newberry South Carolina, entry, French antique dining chairs, Heavily Carved Antique Furniture, Hunting Style, Louis XV, Mechelen, Mechelen Style Antique Furniture, Newberry South Carolina, Stained glass on March 28, 2018 by admin. We were greeted with a friendly woof at the door of Erin’s beautiful home in Arlington, VA! Bo, the charming Golden Retriever, had his favorite toy in his mouth and wanted to share it with me. We were there to deliver a gorgeous round center table from the high quality manufacturer, Jonathan Charles, and I think you’ll agree it looks smashing in its new home. And here is another close-up of the Jonathan Charles center table or accent table, with its lower tier shelf and curvy saber legs. It’s a very striking design, isn’t it? I especially love how Erin arranged this space so that the curved design of the light walnut table echoes the curved design of the handsome vintage Art Deco grandfather clock on the back wall. The clock was brought back from Germany by family members. The warm walnut wood tones of both pieces are a perfect complement in the space with the dramatic painted navy walls and bright white molding and trim. It is obvious that Erin has a flair for interior design. Her choice of rugs in both the foreground, and in the living room behind, and even the throw pillows on the sofa, tie all of the colors in the two spaces together and draw the viewer’s eye into her lovely home. The beautiful piece of art on the wall is part of the family’s growing art collection and was found on a vacation in Louisiana and shipped home. What a warm and inviting entryway space with living room beyond – we’re impressed! 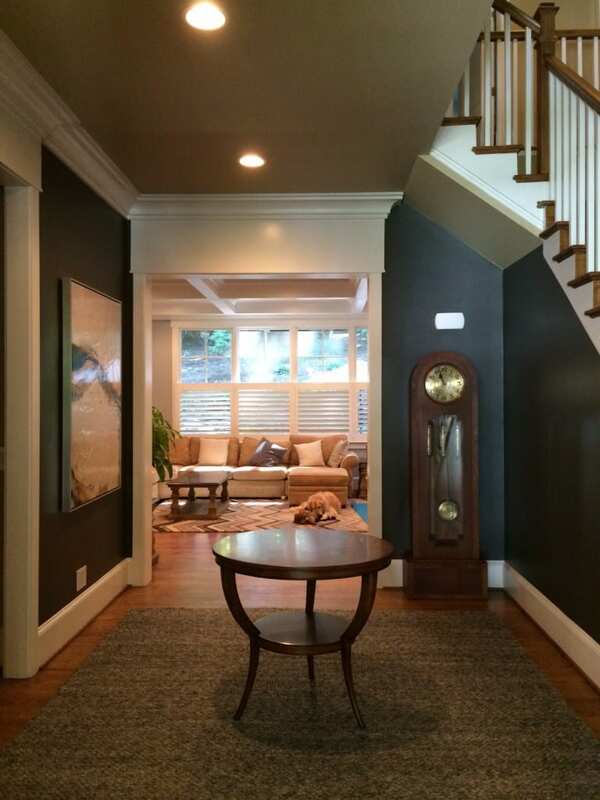 Thanks for letting us share photos of your lovely home, Erin, and thanks to Bo for greeting us so warmly too! 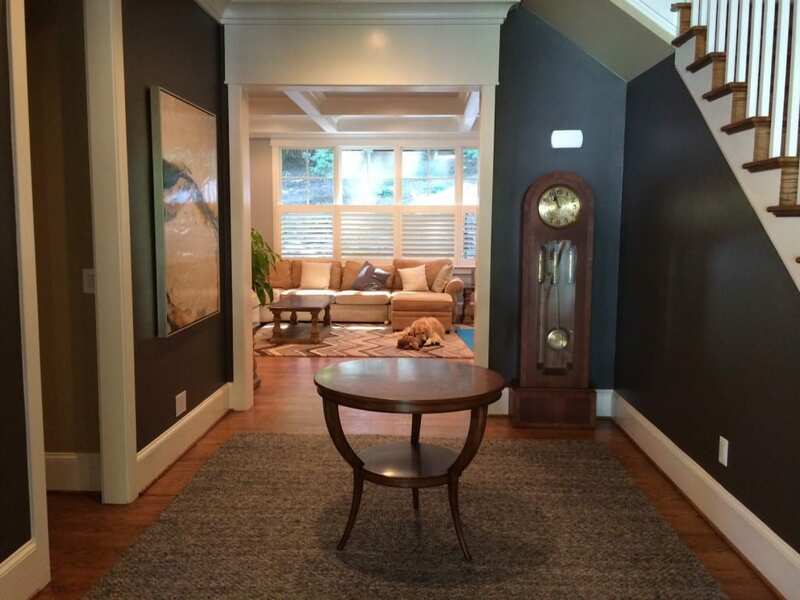 This entry was posted in Client Spotlight and tagged accent table, antique inspired furniture, Art Deco clock, center table, entry, entryway, hallway, high quality reproduction furniture, interior design, Jonathan Charles on December 15, 2016 by admin. Today I have some photos of antique French furniture and Mechelen buffets that are a real treat to see in our customer Tamra’s classic but eclectic home. The outside of her Greco-Roman mansion in Newberry, SC, is gorgeous too! You may think the dining room looks a little familiar as this home used to be owned by our good customers, Roger and Peggy. S. They recently sold their elegant 1890s home, built when Newberry was a booming textile mill town at the turn of the century, to a wonderful new caretaker – Tamra! Roger and Peggy left the French Country sideboard in place in the dining room because it fit so well on that wall under the stained glass windows and they didn’t have a spot large enough for it in their new home. Tamra chose a 1930s French Country Louis XV refectory table in walnut which is super-useful as it extends to 9.5 feet long – great for a dinner party! She also bought two sets of Hunting chairs dating to the 1880s in slightly different color oak finishes in order to mix things up. 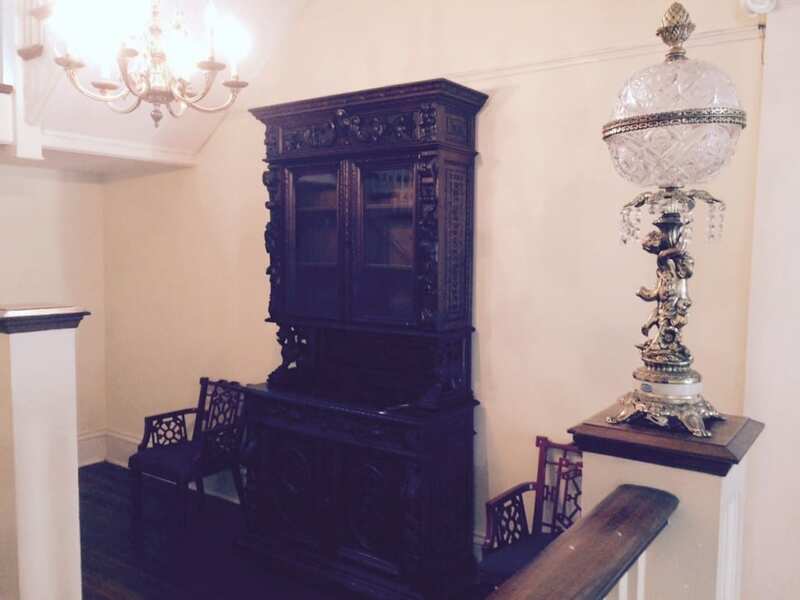 Tamra also had her eye on an antique Hunting Buffet for the dining room. The original glass had been damaged on this handsome oak heavily carved Hunting Buffet dating to 1880, so we had replaced it with chicken wire to give a slightly rustic feel to the piece. It works great in Tamra’s new dining room as there is an interesting juxtaposition of formality with the classic fireplace mantel, moldings, and crystal chandelier and the touch of rustic country with the less formal French Country pieces mixed with the chicken wire in the Hunting buffet. This close-up of the antique French Hunting buffet shows more detail of the carved oak and the heraldic crest. There’s plenty of space for Tamra to store all the dishes and stemware and silver that she’ll need to feed everyone gathered around the large table! 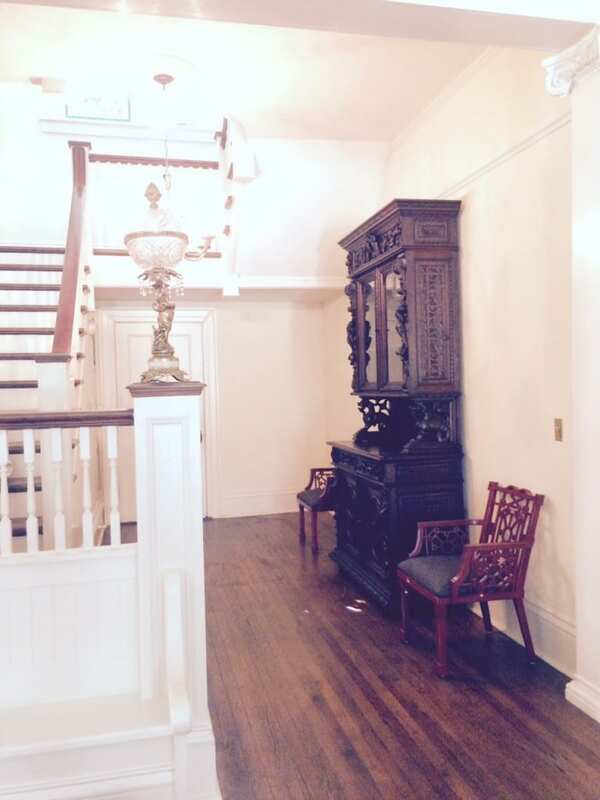 Tamra also fell in love with another heavily carved Hunting Buffet for the hallway at the base of her stairs. Tamra has a wonderful eclectic touch and paired antique Chinese arm chairs from her husband’s travels next to the antique French buffet. The flamboyant carvings on the oak buffet portray mythical griffins, oak leaves, fruits, and birds (right down to their feathery details!) The 1880 French buffet boasts its original wavy glass doors. 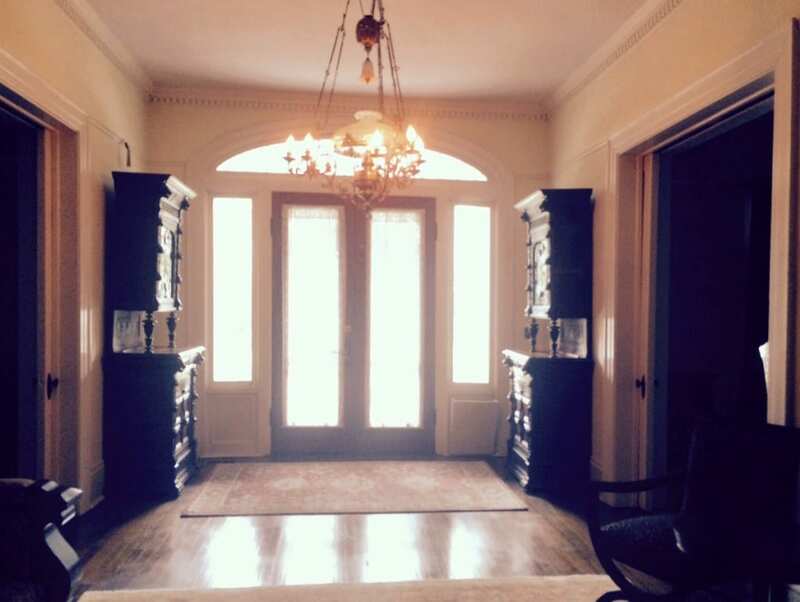 As we were delivering Tamra’s furniture, she pointed out that she was still looking for a pair of interesting pieces to go on either side of the huge front door in the front hall. I knew exactly what would fit the bill! I recommended a matched pair of narrow antique Mechelen buffets which still have their original stained glass even though they are a century old. This shot of the stained glass shows just how intricate it is, surrounded by oak carvings. The Flemish Mechelen style was a Belgian interpretation of the French Hunting style, so I knew these pieces would work well with the other antique furniture Tamra bought from us. Here is one buffet in place. The stained glass catches the light beautifully as it streams through the sidelights on either side of the massive front door. And this is the pair of Mechelen buffets creating a magnificent entrance. The lovely dining room and the whole house is a reflection of Tamra herself – very classy yet down-to-earth and fun! Welcome to Newberry, Tamra – we’re glad you’re here! Aimee owns EuroLuxHome.com with her husband and best friend, Greg. Aimee sources amazing antique furniture, vintage lighting, & high-quality reproduction furniture to help her customers decorate their homes in a unique way. She loves her 9 (you read that right) fuzzy children and is renovating a 1920s bungalow in South Carolina. Find us on Facebook or connect with EuroLux on Google+. Or you can sign up here to receive this blog in your inbox. This entry was posted in Antique Furniture, Client Spotlight and tagged antique dining table, antique french buffet, Antique French Country table, antique French Hunting Chair, Antique Hunting Buffet, dining room, entry, French antique dining chairs, French Antique Hunting Buffet, French Country, French Country cabinet, Heavily Carved Antique Furniture, Hunting Style, Louis XV, Mechelen, Mechelen Style Antique Furniture, Newberry South Carolina, Stained glass on October 22, 2015 by admin. 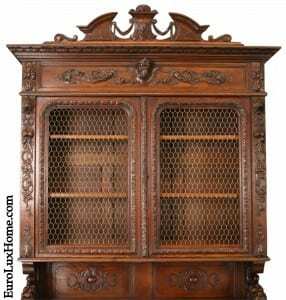 What is the Louis XV Style of Antique Furniture?